This is Katie and Simon’s stationery we designed for them they wanted a vintage feel to all their cards but still keep it personal. They also wanted to add hearts as well as pink and gold from their wedding theme. We created a monogram for them having their initials linked with a heart. This appears as you can see on all their stationary throughout the wedding. They used a photo from the engagement for the save the day cards showing of Katie’s new ring. On the inside under the photo we put that it was taken at Simon’s proposal. The wording as you can see was really stylised and simple adding hearts between the numbers of the date. We added the monogram on the left hand side. We used a pink rose that would be used in the wedding bouquet and this tied in really well with the colour theme. 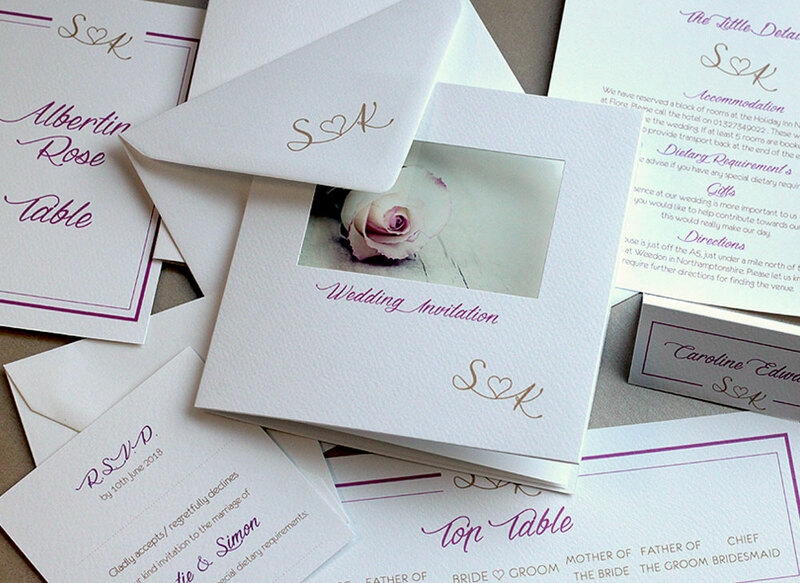 We also added the monogram to the cards but also to the back of the envelopes which gives a lovely finished look. Katie and Simon also wanted all the envelopes with guests address details printing all in matching fonts. 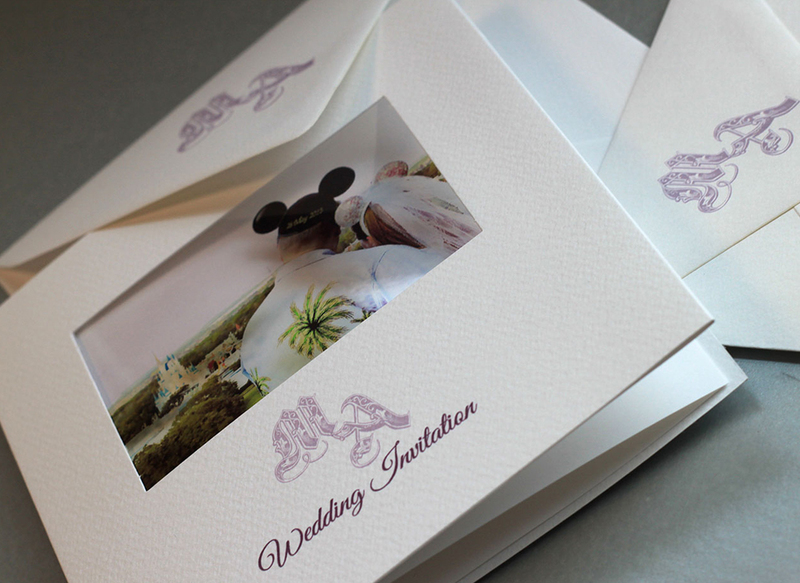 The doesn’t cost very much but its lovely as there is no handwriting just all personalised to match the invites. I loved their information sheets adding the monogram and the title is great ‘The little details’. The rsvp cards all tied into the theme too. 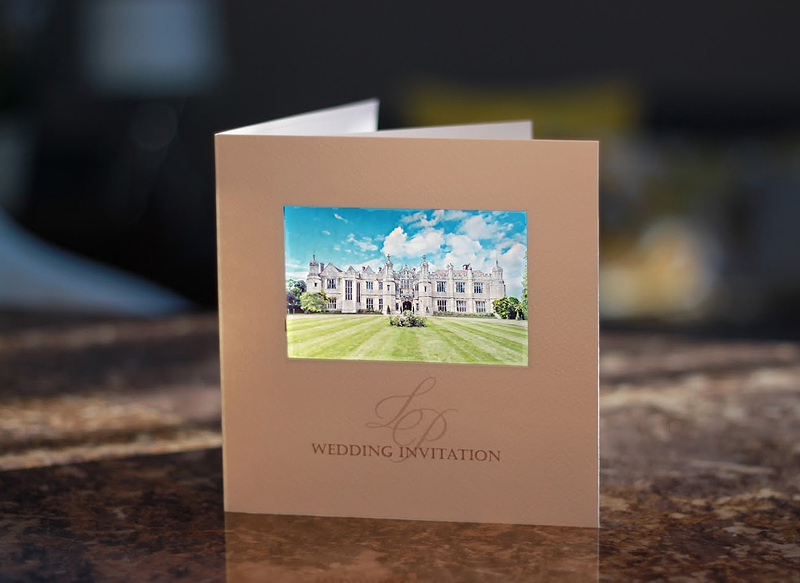 Used a photo of their venue at Dodmoor House, Weedon on the order of the day cards. The flowers in the photo we just photoshopped so they tied into the pink colour theme. This was a great way of letting guests know what was happening throughout the day and who the wedding party was too. This all matched adding the monogram and matching fonts. The place names worked really well in the fancy font but on the table plan we kept to the simpler font so guests can find their tables easily on the day. These looked fabulous and really captured what a fantastic wedding day they both had. 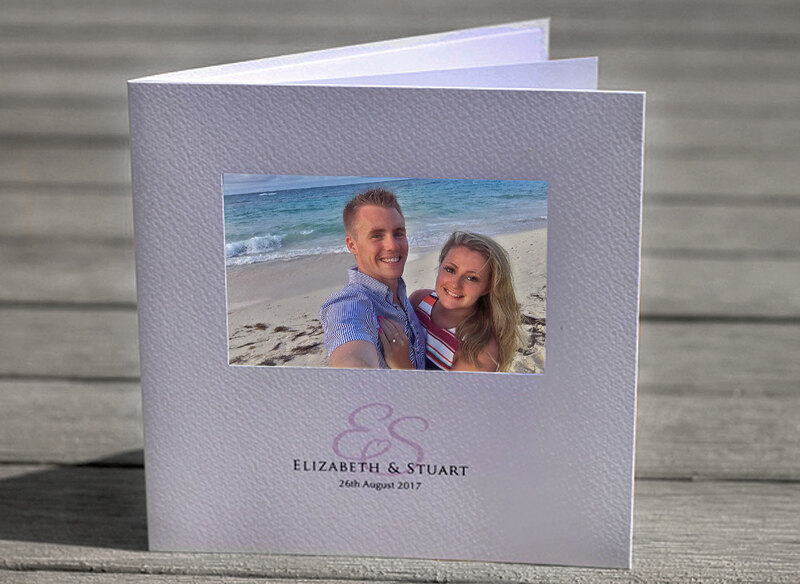 We added their names, date and venue under the photo on the inside as guests and family will keep them as a lovely lasting memento of the special day.